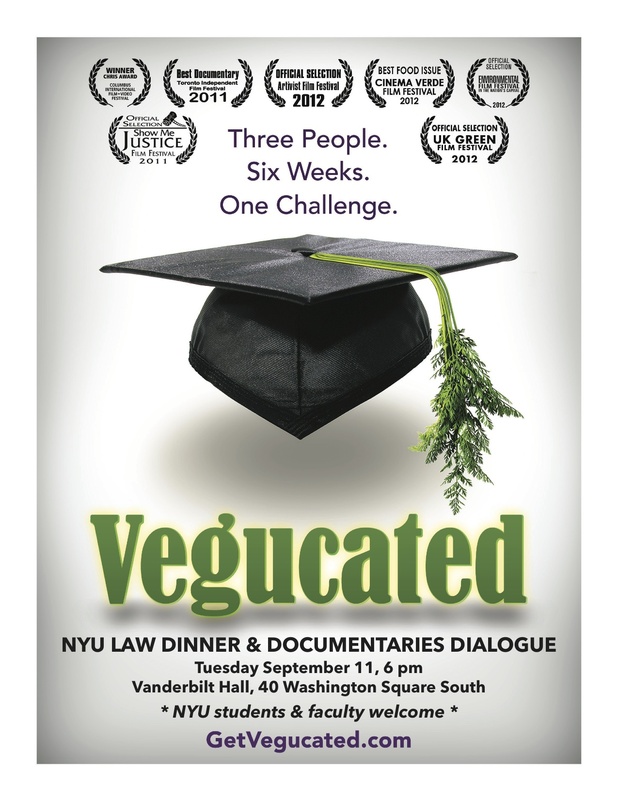 Come out as the Wagner Food Policy Alliance, NYU Law and NYU Meatless Mondays put on an evening of food, fun and film! We will be screening two films: Vegucated and American Meat following dinner at 6 PM. Both filmmakers will be present for Q&A and discussion. Come take a break from the finals crunch to join us for yet another tasty, free vegetarian lunch on Monday and be a part of building the NYU Meatless Monday movement! Rudin Forum 2nd Floor | 295 Lafayette St.
Shaved asparagus and beet salad with mustard vinaigrette and walnuts, lettuce wraps with veggies and tofu, coconut rice, and their own chocolate truffles, thanks to the NYU Student Food Co-op, a brand spanking new student group offering education, catering and sustainable, affordable options to the NYU community. Check them out! If you haven’t already, you can still make a pledge! It’s all here online on the site, so take a minute to wander around! We’re also tweeting away, follow us @NYUmeatless! Send in your pics of favorite local spots, what you’re cooking up and home and how you’re living out a sustainable life in NYC. Join us today at Hayden Dining Hall for tempeh, seitan, and quinoa, oh my! Make your pledge, pick up a button to claim your MM status, grab some resources on meat-free meals. We’ll be here from 12-3pm for lunch and 4:30-6pm for dinner! Join us TODAY, Monday, April 2nd to kickoff yet another tasty, vegetarian lunch and be a part of building the NYU Meatless Monday movement! The message of a particular blog entry Marion Nestle wrote on her site, “Food Politics”, stuck with me although I frustratingly can’t seem to find it in her archives. Centered around food shopping and how to go about it, she assembled a personal ranking system for the qualities she seeks out in the grocery store—her preferred ingredients were both local and organic.In a pinch, she would opt for an organic product first if a local one was unavailable. While I agree with Marion Nestle in principle, I’ll admit the harsh realities of attempting to make healthy and ecologically friendly food choices on a limited budget with time pressures—often I find myself merely attempting to fuel myself with something healthy, trying my best to recognize some of my deep-rooted beliefs in responsible purchasing. -The items we buy the most and eat on a daily basis—rice, beans, oatmeal, nuts, dried fruit—are bulk bin staples. Why not get a deal on something you constantly purchase? -You can buy more, reducing grocery trips. If you eat oatmeal for breakfast every day, go ahead and buy three pounds of the stuff-it won’t go bad, and you’ll save yourself from buying a cylinder of it every week or two. -Reducing packaging: every time you buy a box of rice, cans of beans or bags of nuts, you’re contributing to the waste-steam. Depending on which store you visit, you can bring our own bag or container, weigh it first and then add your products. You can always save the thin plastic bags you use for veggies and bring those to the bulk bin. -You’ll probably eat more whole grains and beans. As a vegetarian, whole grains and beans like quinoa, chickpeas, brown rice and lentils tend to be cheap, wholesome everyday choices. Introduce yourself to new grain varieties like amaranth or buckwheat groats. You’ll need to soak beans overnight before cooking them, but once you learn how to do this, you’ll realize how easy it is. A good slideshow from Serious Eats on how to cook dried beans here. -Saving money. Compare prices on packaged items you get—for example, oatmeal typically runs anywhere from .99/pound to 1.30/pound in the bulk bins, compared to $4/box of instant oats. You can control the ingredients that go into your oatmeal as well! Also, trendy items like quinoa are always cheaper if you buy here. -Depending on location, you can find amazing items in bulk. The 4th Street Food Co-op in the East Village has bulk tofu, oils and vinegar, flaked coconut and sugar in addition to traditional offerings. The Park Slope Food Co-op has flavored nus, spices and chocolate covered items. -You can store your bulk items in re-purposed containers like old yogurt containers, or invest in some attractive mason jars. Check out Craiglist to see if anyone near you has extras. 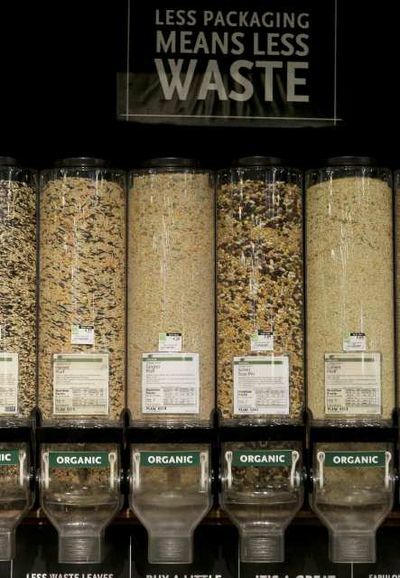 Here’s a list of some stores that offer bulk bins in the city—check around your area for more! Since opening in 2008, Dirt Candy has been booked for reservations for weeks on end. Diners eager to head to the East Village to try out seasonal vegetable gems like coconut tofu and jalapeno hush puppies have to wait patiently for a reservation. Why are New Yorkers willing to wait for vegetables? It’s all in the love and preparation. 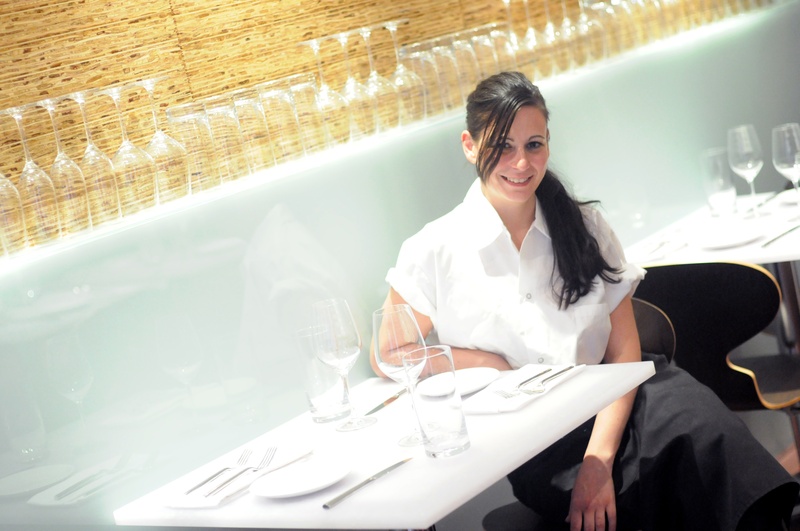 Amanda brings experience from famous vegetarian restaurants Pure Food & Wine and Angelica’s Kitchen as well as plenty of non-veg spot to her own restaurant. Something’s working: Dirt Candy earned one of the prestigious 85 spots on the 2010 Michelin “Bib Gourmand” list. Check out our Q&A between NYU Wagner student Alisa Ahmadian and chef Amanda Cohen to learn more about making vegetables the focus of the meal. Then, get yourself a res at Dirt Candy for a special dinner! 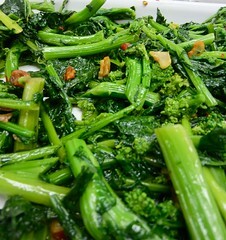 NYU MM: You own a vegetable-focused restaurant, but you’re not completely vegetarian yourself. Do you think that there are a lot of persistent stereotypes about the in-superiority of vegetables compared to meat? How can we change this? Amanda: The only reason to eat vegetables is because they taste good. My focus isn’t on converting people to the joys of vegetables, it’s on making great food. But people do come with a lot of preconceptions about vegetables and it’s my job to blow those out of the water by giving my customers vegetables that taste unlike any they’ve ever had before. When I make a cucumber dish I spend a long time thinking about cucumber, seeing what’s been done with it before, finding ways it hasn’t been used, trying to bring out its essential taste. Then I make it fun and unleash it on the plate. NYU MM: Why should we be eating our vegetables? Amanda: Vegetables are for thrill seekers. Think of how many steakhouses there are in the world. Steak has been done. But vegetables are relatively unexplored, especially in the West. You can still be surprised, shocked, tittilated and terrified by vegetables. Most chefs don’t care much about them, so every day in my kitchen is like a rock and roll rodeo because there are no rules, there is no one telling me how things should be, there is no competition. It’s just me seeing how far I can push myself and vegetables. Sometimes they push back, but that’s another story. NYU MM: Do you have any tips for novice cooks interested in incorporating more vegetables and vegetarian dishes into their repertoire? -Most people cook vegetables too much or too little. Roast way longer than you think you should, and sautee way shorter. – Use more salt and butter, or coconut milk, or olive oil than you think you should. Fat carries flavor and it rounds out a dish and binds it together. – Hit your dish with some extra flavor at the beginning and at the end. Cook some onions and garlic or some ginger and onions in your olive oil before you cook your vegetables in it so that the oil has a little flavor. Use a splash of citrus at the end to brighten your dish. NYU MM: What are your favorite NYC spots for good veggie-focused food? Amanda: New York has an embarrassment of great vegetarian restaurants. Tiffin Wallah on 28th Street, or Chennai Garden or Saravanaas right around the corner, all have great Indian food. When I want my Cantonese Chinese fix I’m partial to the Veggie Dim Sum House in Chinatown as well as House of Vegetarian. Hangawi in K-Town is great for Korean food. And some of the best Sichuan food around is at Legend on Seventh Avenue. And if you want Thai, there are tons of vegetarian dishes at Zabb Elee on Second Avenue. NYU MM: Having been to Dirt Candy as a vegetarian with meat-eaters, I’m curious about your personal transition from eating meat to eating only fish. What were your motivators for the switch and how did you do it? Gradual transition? Cold turkey? I was a vegetarian for years and years (and a vegan for a few years, too) but about eight years ago I realized that the only way to keep up with other chefs was to eat their food and to eat the food they made that they truly cared about, which was rarely vegetables. So I started eating seafood. Vegetables are my true love and my real passion, but I think I have a professional obligation to keep up with what other chefs are doing. As for how the switch happened, it was pretty instant. I just decided that being a good chef was more important than my personal feelings and that was it. I still don’t like fish that’s super-pungent, like anchovies or bottarga, but everything else is fair game. NYU MM: The Meatless Mondays campaign is about more than just cutting down on meat consumption: we’re trying to tackle some of the bigger issues associated with meat production like environmental degradation and scary public health issues that are unfortunately part of our industrialized meat system. I know that Dirt Candy uses organic dairy and eggs, is this part of a philosophy on environmental sustainability and health? I don’t have a philosophy at Dirt Candy beyond making vegetables taste great. A lot of restaurants have a political or a health point of view, which is fantastic, but I don’t. I use organic where I can and where I think it matters, and dairy and eggs are one of the big places where I feel like you can tell a difference. NYU MM: What are your recommended “must-eats” for a first time visit to Dirt Candy? Some of the most popular dishes here are the Stone-Ground Grits with Tempura Poached Egg (or Tempura Watercress if you’re a vegan), Pickled Shiitakes, and Huitlacoche. There’s also the Swiss Chard Gnocchi, which is made with Caramelized Yogurt and Garlic Granola. And the Roast Carrot Buns are a big favorite. But the dish I’m the most proud of is one I just call Cabbage. It’s a salad made of about five different kinds of cabbage, each one prepared with a different technique, and fried wontons that are made with cabbage juice so they’re purple. It was a blast to put together and because cabbage is no one’s idea of a favorite food I always get a kick out of converting people to the cabbage cause. Meatless Mondays are officially ON at NYU. Come out and be a part of the movement, pledge to cut the meat once a week. 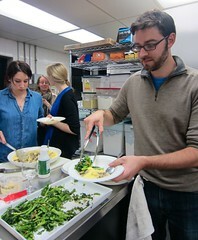 Keep an eye out for meatless events this Spring including free tastings, cooking demos, speakers and raffles. All event details will be listed here as confirmed, check back often! Special offers and discounts will be made available to students who pledge to cut the meat this year on Mondays. Make your pledge here on the website, show up and get yourself a button to prove it. Any questions or want to get more involved with the planning?